Against a Kennedy team that put only four wrestlers on the mat, the Whitman Vikings won big, 66-13. The wrestlers that took the mat for Kennedy, however, gave the Vikes a handful. Ten Vikings won by forfeit: Isaac Besrat (113), Peyton Casamento (120), Caleb Brenner (126), Matthew Lindstrom (132), Colby Fong (145), Seng Bobbitt Hanna (170), Thomas Santora (182), Danylo Hartzler (195), Yussef Zaki (220), and Tom Wilmarth (Hwt). Charlie Imperial (152) dominated his opponent and won by pin. After a quick double-leg takedown, Charlie held a cradle for nearly 30 seconds, but could not secure the pin. He broke the hold for three points, then claimed another near fall at the end of the period. In the second period he used a single leg and high crotch for a takedown and 10-0 lead, before using a half for the pin at the 1:20 mark. Stephanie Solosso made her varsity debut at 132. Down 0-7 after a snap take down in the second, Stephanie reversed and nearly pinned her opponent, before being reversed for a 5-9 deficit. Starting up in the third, Stephanie claimed another near fall to narrow the gap to 8-9, but was reversed as she attempted to roll out. Two more near falls led to an 8-16 final. John Mackall (160) was tied 7-7 late in the third, but his opponent won the last-ditch takedown struggle for a 7-9 decision. Peter Li could not escape his opponent’s double-armbar move, and was pinned at 1:30 in the second. 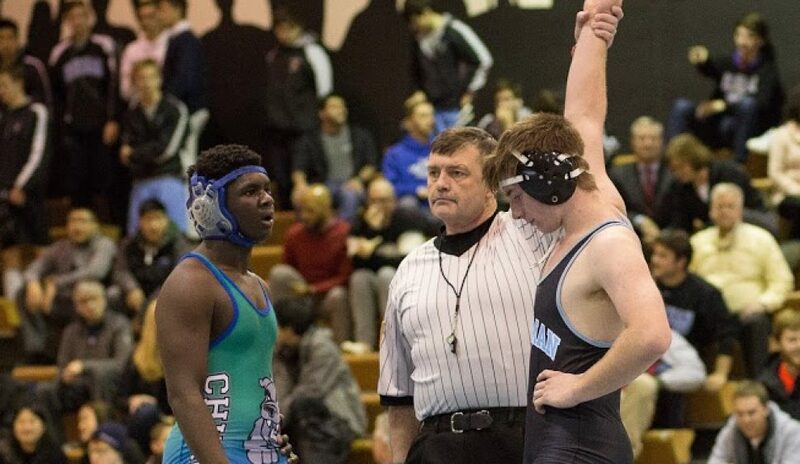 On Saturday, the Vikes host a perennially strong Paint Branch team, which has three county-ranked wrestlers at the upper weights. The match starts at 1:00 pm in the Whitman gym. Come out and support the Vikes!